Discussion in 'Resources' started by Prashant Sharan, Apr 5, 2019. 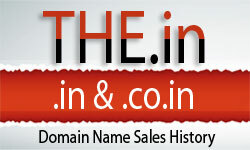 Domains are one of the few products that buyers often pay more for in order to get less. Domains are, of course, made up of letters and/or numbers and the ones that have the fewest characters often sell for the most money. Shorter name are highly valued because they are easy to remember, making them great brand names, and easy to type into a browser address bar, cutting down on the chance of typos that send would be visitors to the wrong destination. The latest example of slim always being in when it comes to domains is the $110,000 sale of numeric domain 1992.com that tops our latest weekly all extension Top 20 Sales Chart. Seller Bo Zhang made the sale in an eName.com auction (eName is a large aftermarket domain sales platform in China - a hotbed of numeric domain sales). We were able to verify the sale through documents Zhang sent us with additional help from a reliable independent source in China who contacted eName for us to get further corroboration.